Tomorrow – Saturday May 9 – is Election Day. 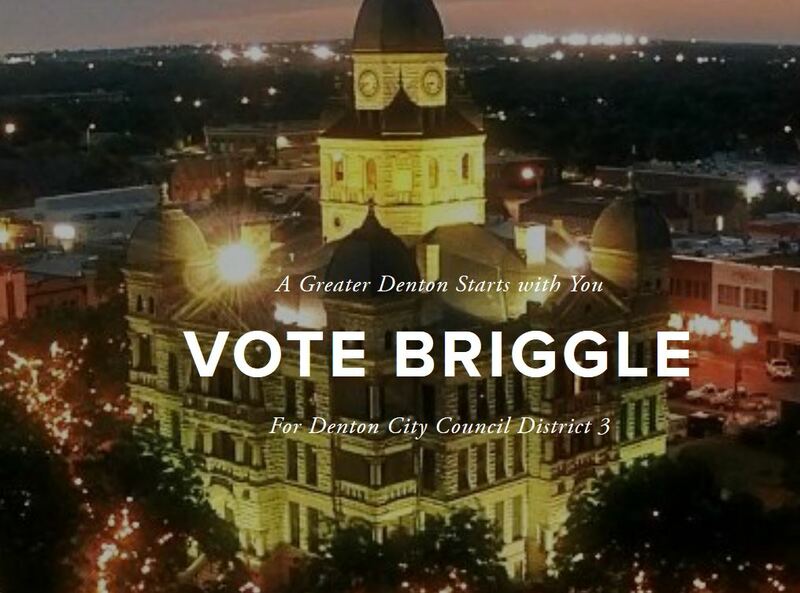 If you live in District 3, please go to the polls and cast your vote for Amber Briggle. The polling location is North Lakes Recreation Center (on Windsor just east of Bonnie Brae). Voting is from 7 a.m. to 7 p.m. I suppose it is easy to discount my endorsement of Amber. I am her husband after all. But because of that very fact, I can give you an insider’s perspective on why she’s the right woman for the job. I could tell you about where she stands on the issues…but you can go to her website to find that. I could tell you about how hard she has worked to not just learn about every facet of city governance but also develop ideas for how to improve things…but you can read her blog about all that. No, I just want to tell you about how much she loves Denton. From the moment we moved here, little d stole her heart. For six years, my wife has been having an open affair with Denton. All she wants for Christmas are gifts from the community market. And Denton-themed t-shirts. And a beer glass from East Side. All she wants to do on date nights is sit on the square and admire the courthouse. I have to sit kind of to the side so I won’t block her view. All she wants to talk about at dinner (on the rare times we see each other) is how she helped make sure a sidewalk would get built at her Planning and Zoning Commission meeting or how cool it would be if we could put a micro-park in that unused swath of parking lot out by the Kroger. I mean, I might want to talk about my day at work, but no, we have to hear all about new road standards. All we eat are vegetables from Earthwise. I mean, I like local carrots as much as the next guy, but…well, I won’t say anything. Just pass the carrots. Amber recently bought a necklace that is just a little map of Denton inside a glass frame. She loves it. She shows it off to everyone we see. “Look at my necklace!” she giggles. It’s embarrassing how much she loves Denton. Now, you tell me, do you think someone this infatuated is going to sit by and watch Big Austin trample all over little d? Amber helped write the new drilling ordinance that City Council was about to pass before the oiligarchy down in Austin gutted our local control. That ordinance would help reduce the frequency of accidents like we saw last night with the gas well explosion. Local control isn’t some idea for her. This is personal. Amber is an independent thinker and a consummate professional who has weathered attacks against her with grace. She is poised and open-minded and a team player. But most of all, she wears her heart on her sleeve and that heart has a little d tattooed on it.